Four were injured in a three-vehicle accident Thursday at the intersection of Rawling and Delaware streets. Four individuals were injured Thursday afternoon in a three-vehicle accident at the intersection of Rawling and Delaware streets in Washington C.H. At 2:11 p.m., an accident was reported to the Washington Police Department. According to police, a total of 11 people were inside the three vehicles involved in the accident. No names were available as of press time. All four who were injured were transported by Fayette County EMS to Fayette County Memorial Hospital for treatment. One of the vehicles failed to yield, causing the crash, police said. More information will be released once the investigation is complete. Personnel from the Washington Fire Department also responded to the scene. 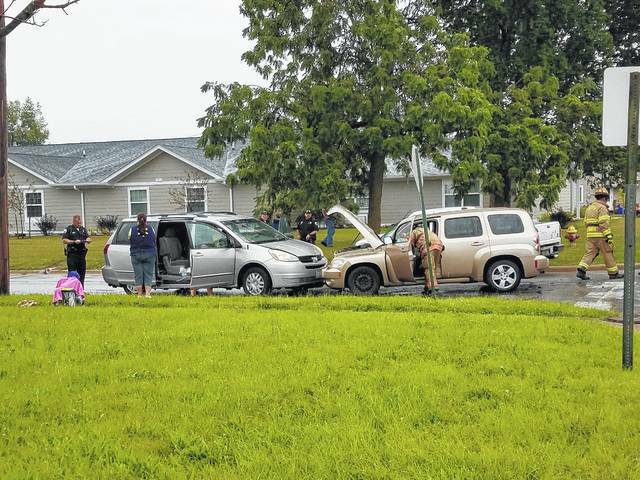 https://www.recordherald.com/wp-content/uploads/sites/27/2017/07/web1_20170727_142232.jpgFour were injured in a three-vehicle accident Thursday at the intersection of Rawling and Delaware streets.